Showing 9 articles from August 13, 2018. When we think of barbeque, we think of good ole' southern barbeque. Now, when you hear about barbeque in the area, you immediately think of Bonanza BBQ in Toledo, the place with the pig smoker in the front. Dan and Chris Gorton opened their first barbeque restaurant/catering business in 2015 and have been growing ever since. The Winlock community continues to invest in infrastructure essential to developing the Benaroya Pacific Northwest Regional Logistics Center near Winlock. During the last Legislative session Senator John Braun successfully advocated and retained $1.5 million in funding to extend utility infrastracture to the Benaroya site. The City of Winlock will utilize the Legislative funding to build a 1.3 mile (7,000 feet) of waterline that will be extended to the south end of the Industrial Park. A new youth organization is coming to Southwest Washington to help the youth in our area. 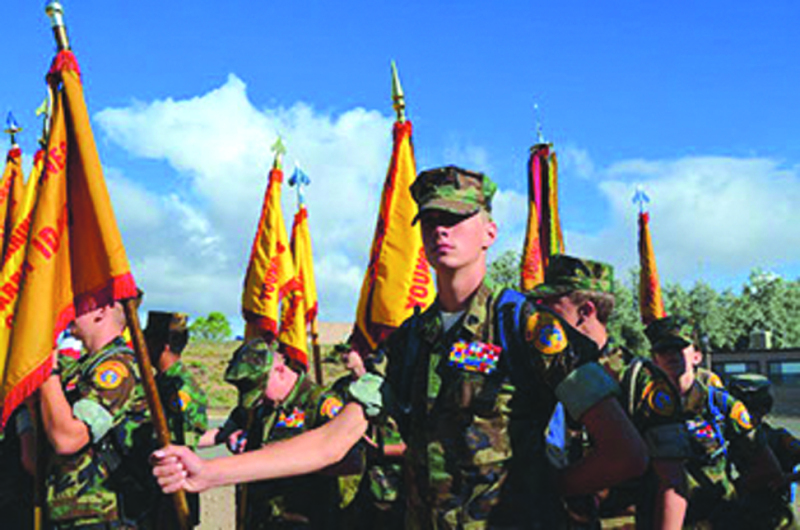 The organization is called Young Marines; their mission is to positively impact America's future by providing quality youth development programs for boys and girls. The program also helps the youth enjoy a healthy drug free lifestyle. The 122nd Annual Pacific County Fair is set to kick off on Aug. 22 and runs through Aug. 25 with this year's theme "Coming Home." 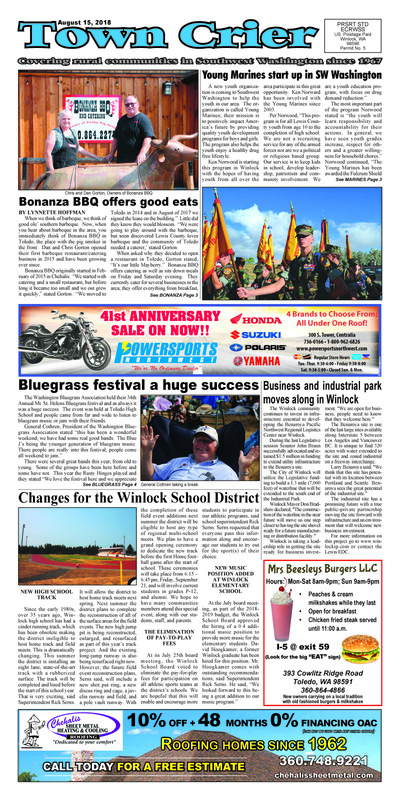 The annual fair brings families from all over Pacific County and beyond together. The fair will have food vendors, a beer garden, live music, 4-H competitions, horse racing and cattle sorting, a traveling zoo, a cheerleading demonstration and much more. Photo by Jeff Clemens - Deputy Randy Wiegardt along with partner Ciko with Deputy Jesse Eastham in the back. Deputy Wiegardt was explaining to residents how he works with his K-9 partner and the commands he uses. 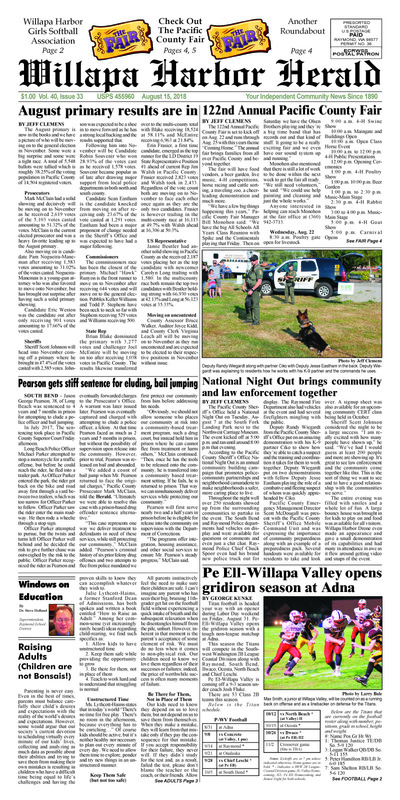 The Pacific County Sheriff's Office held a National Night Out on Tuesday, August 7 at the South Fork Landing Park next to the Northwest Carriage Museum. The event kicked off at 5:00 p.m. and ran until around 8:00 p.m that evening. According to the Pacific County Sheriff's Office National Night Out is an annual community building campaign that promotes police-community partnerships and neighborhood camaraderie to make neighborhoods a safer, more caring place to live. Throughout the night well over 250 residents showed up from the surrounding communities to partake in the event. The South Bend and Raymond Police departments had vehicles on display and were available for questions or comments and even just a chit chat. Raymond Police Chief Chuck Spoor even had his brand new police truck out for display. The Raymond Fire Department also had vehicles at the event and had several firefighters mingling with the public. SOUTH BEND - Jason George Pearson, 38, of Long Beach was sentenced to 4 years and 7 months in prison for attempting to elude a police officer and bail jumping. In July 2017, The sentencing took place in Pacific County Superior Court Friday afternoon.